The color reproduction of conventional TFT-LCD modules had challenges to match the performance of OLED. There was always a gap between 30% to 40% less gamma range. The colors shown on the TFT display were often different from the actual colors and were not as vivid as they should be. 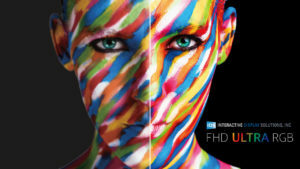 Interactive Display Solutions (IDS) is proud to present a brand new enhancement and calibration technology called Ultra RGB that reduce the gap of color difference from 5% to 8% less than an OLED. At the same time, it is part of our flexible customization product family. The options include brightness, interface, mounting structure, endurance bonding and PCAP touch panels. Click the button below for more details of standard products, enhancement requests or to schedule an on-site demonstration of samples.